In a medium heat, place a mixing bowl, stir plain and flavored gelatin powders together in it. Keep on pouring the boiling water until it’s fully dissolved. Allow the gelatin to cool till it is slightly warm. Stir the whipping cream into the gelatin mixture. Add in green food coloring (you'll probably need 10 drops or more) and keep on stirring until your gelatin gets that purple-brown-grey color of earthworms. With 100 straws fully extended and snug in your chosen container, pour the gelatin mixture over the straws, filling the container. Cover the container and let it chill for at least 8 hours. You can make this preparation and store it prior two days of your Halloween party. Remove the straws from the container. (You may cut or dispose of the container). Place batches of 4-5 straws under hot running tap water for a couple of quick seconds. Remove "worms" from their straw casings, pressing it with your fingers. Set on waxed paper to set up. Repeat the process until all the worms are removed. Keep it covered and let it chill, on waxed paper, for at least 2 hours. Serve it in a chilled bowl, as pictured. Now wait and watch how all the kids gobble up this fun Halloween party food with excitement. Start pouring the remaining evaporated milk and whipping cream into a heavy sauce pan. Slowly set the heat to a boiling level. Add sugar, salt, and whiskey to the boiling milk mixture. Stir till it gets dissolved. Remove the mixture from the heat and pour the boiling milk mixture through a fine-mesh strainer into the gelatin-evaporated milk mixture. Stir in the vanilla extract. Add a pinch of black paste food coloring to it to gete the realistic "grey matter" look. 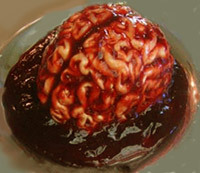 Follow the manufacturer's directions for your gelatin brain mold, pour mixture into your brain mold and refrigerate it overnight. Top with cranberry "gore" glaze just before serving it. 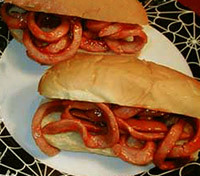 Slice each hot dog into long, worm-like strips. Place the hot dog strips into boiling water and cook until they begin to curl a bit. Then drain the water off. 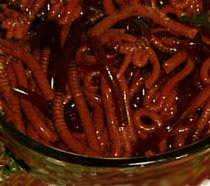 Replace the cooked hot dog worms on the pan and toss it with ketchup until thoroughly mixed.